A tiny Baby Digimon wearing a metallic helmet. Within the two horns attached to its helmet, it has antennae that are able to receive any radio wave or sound. 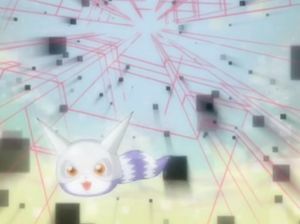 Caprimon is in possession of bat-like traits, as it has weak eyesight, and produces ultrasonic waves from its mouth, recognizing the objects ahead of it from the rebounding sound wave. For that reason, Caprimon is able to act irrespective of day or night. Its technique is generating a resonance between its two horns (Howling Hertz). If they suffer this technique, even a large Digimon will be completely paralyzed. adj., From capricious 「カプリシャス kapurishasu」 meaning "impulsive; peculiar". Generates a resonance between its two horns to paralyze the opponent. Caprimon is the partner of Shiota Hirokazu. Devolved from Guardromon, and returned to the Digital World. Appeared as one of the students in Togemon's school. Nearly drowned, but was saved by Tunomon, after evolving to Gabumon. Found at Park Town. Evolves to Kotemon at level 11. 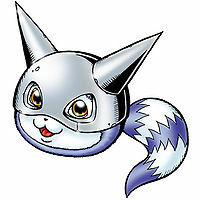 Can be born from a DigiTama or reversal evolved from Hagurumon from Sewage Tunnel, Pawn Chessmon (Black) from Chrome Mine, or Kotemon from Training Mountain. He can evolve to Hagurumon if above level 10 and Machine EXP above 250, Pawn Chessmon (Black) if above level 10, or Kotemon if above level 8 and Holy EXP above 200. He also gives you a request mission to obtain a Metal Brush from a same Caprimon at Bug Bug Jungle. Can be found at Angler Tunnel. Can evolve to Hagurumon if above level 10 and friendship 50%, or Kotemon if above level 12 and attack 60, or Pawn Chessmon (Black) if above level 11 and Machine EXP 200. An NPC of Caprimon can be found at Darkmoon CITY. 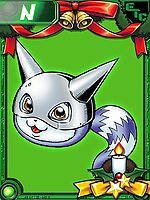 Evolves from Zurumon, Choromon or Mokumon. 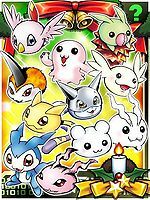 Can evolve to Armadimon, Gottsumon, Toy Agumon or Hagurumon. Can evolve to Gottsumon, Hagurumon or Toy Agumon. 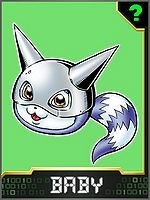 Caprimon is available as a Digimon Medal. Evolves from Choromon. Can evolve to Toy Agumon, Kokuwamon or Hagurumon. This page was last modified on 13 March 2019, at 22:52.